Terror returned to Kurram Agency on Friday when a blast outside an imambargah located in a busy Parachinar market claimed the lives of 24 people and left 90 others injured. Survivors described hiding inside shops after hearing a "huge bang" – then stumbling through dust-choked air filled with the sound of screams, tripping over bodies as they searched for the wounded in the busy market in Parachinar, the capital of Kurram tribal agency. "People were screaming for help... When I looked back everything was filled with dust," shopkeeper Sardar Hussain said. He saw his father "drenched in blood and dust", he told news agency AFP, while the two clients in their store were lying dead on the floor. "We closed doors of the shop as we thought there might be a second blast, but we heard gunshots for a while and people were shouting, so we got out," said Muhammad Ali, a resident at another shop. The market area, where nearly 15 to 20 shops are situated, was bustling at the time of the explosion, as it was Friday and people from other areas had also come for prayers. But the survivors emerged to a scene of desperation, Ali said, describing bystanders carrying the wounded to hospital in any vehicle they could find as security forces arrived. Mumtaz Hussain, a doctor at the Agency Headquarters Hospital in the region told Reuters news agency that patients were brought to them in private cars and ambulances. Emergency was declared in all the hospitals of Parachinar. Pakistan Army and Frontier Corps personnel later reached the site after the blast and cordoned off the area. An army helicopter was also flown to Parachinar for evacuation of the injured, according to Inter Services Public Relations. The intensity of the blast could be gauged from the damage that has been caused to the houses and cars in the vicinity, said Kurram Agency political agent Ikramullah. Shahid Ali Khan, an administration official, confirmed the blast had been a car bomb. According to reports, security forces opened fire to disperse demonstrators who had gathered to protest the incident, injuring several people. Ali and another eyewitness also described seeing security forces fire on the protesters. 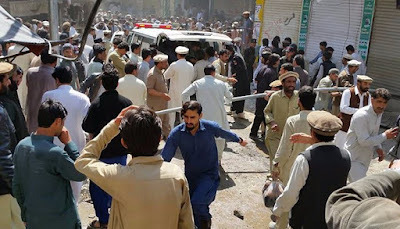 Locals said the injured persons and their attendants were faced with difficulties at the Agency Headquarters Hospital Parachinar due to the dearth of medical facilities and staff. Even though the issue was raised at the Eidgah explosion in January, the hospital lacks the requirements to tackle with emergency situations. In January, at least 25 people were killed and over 65 injured early in the morning when a powerful explosion ripped through a crowded marketplace in Parachinar, officials said. The explosion had occurred early morning around 8:50AM in the city's Eidgah market, where a large number of people were shopping for fruits and vegetables.